(CNN) - The political back-and-forth over the recurrent "war on women" line is playing out again in Michigan politics. A picture showing a trio of male GOP state representatives pretending to read women's fashion magazine has predictably caused a stir among Michigan Democrats. The photo of Republican state lawmakers Pete Pettalia, Roger Victory and Ben Glardon was tweeted out Thursday by a Michigan reporter with the text: "Don't say we don't understand women." The reporter, Jake Neher of the Michigan Public Radio Network, later tweeted that the quote was from Pettalia, "...He said it a couple times, jokingly." @marinakoren That's a quote from Rep. Pettalia. He said it a couple times, jokingly. Pettalia said in a statement that the remark was taken out of context. "During a short break on the House floor, Republican Rep. Gail Haines, a leading advocate on women's issues in the Legislature, gave some of us magazines to read and asked to take our photo with them," Petallia said, according to The Grand Rapids Press. But it didn't take long for House Democrats to fire back with their own version of women's choice reading material. "Real Women read bills not fashion mags..." Democratic legislators responded along with a picture of four women legislators studying pages of documents. Some controversial comments by Republicans over the past few years have fed Democratic claims the GOP is out of touch with women, and this week's Twitter picture battle isn't the first time female issue have inflamed political drama in the Great Lakes state. In April, Republican U.S. Senate candidate Terri Lynn Land took perceptions of the GOP into her own hands with an ad titled "Really" mocking the "war on women" line. "As a woman, I might know a little bit more about women than Gary Peters," Land said about her Democratic opponent in the spot. In the latest clash over gender equality, Democrats throughout the state were quick to capitalize on the picture of the Republican representatives. 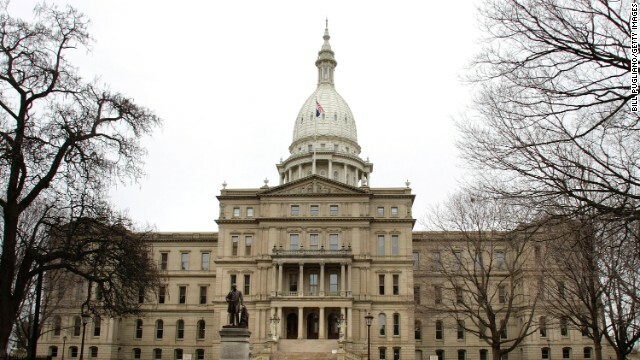 The Michigan Democratic Party called on the men to apologize and the group ProgressMichigan jumped on the comments it called "sexist," asking supporters to donate to protect women's issues. And Democratic candidate for governor, Mark Schauer, said, "No, Michigan GOP, you really don't understand women." The liberals will make a political issue out of 1 ply vs two ply bath tissue– Can they get any lamer???? Surely these people have female staffers who can tell them what they think about the joke. "It targets women by mocking them." Rudy, I've often wondered if men such as these men have any idea whatsoever what the majority of women actually DO think of them on a personal level. Were they to truly understand women, it might wipe the smirks of their faces once and for all. That reminds the story I heard once about the great Wally Wood (one of the best comic book & art artists ever) and how he managed to put his creation, Power Girl, on the spotlight and make her sell comic magazines. How he did it? By drawing her bust big and bigger every single (next) issue, and then by playing possum when the sales started to rise after six or seven months. The dumbed down GOP knows how to get votes, HATE EVERYBODY !!!!! On a second thought, it wasn't 'funny' in the 70's either. You wouldn't josh old Gunderson would you? Anybody shut down Hillary yet? Even Putin Tiptoe around Hillary. Didn't Michigan send democrats to showers in Michigan? Only War on Women in befuddled mind of Liberal. So funny. Remind me to laugh, NOT. The guy on the left is such a clown or really doesn't know how to read. Magazine is upside down. I know a lot of women who don't read these magazines anymore. We have evolved but the teaklans are still living in cavemen days when it comes to women. Bumper sticker for these fools. LOL. Ah, but the stories I could tell on a personal level ... 🙂 ... that weren't funny then and aren't funny now. That some folks seriously think their wive's, mother's, grandmothers, daughters, aunts, nieces are deserving of such stereotypical condescension simply amazes. Telling women where to place their uterus isn't a war on women in the republicans mind they know its a old white mans world, hell they can' t wait for the new episodes of Leave it to Beaver and the Andy Griffith show to hit the air. Right Ol' Gunderson? Only to realize that he is talking to the 'black dude' himself (Cleavon Little)? I tried to find a similar situation when the joke was on gender discrimination in all the comedies I've watched, but I haven't found any. Do you remember one? "OMG..... It's a JOKE people!!! Geez......"
It's just not funny to anyone but old, rich, white Christian men. But keep it up, please.... I for one am starting to see the humor in your slow and tortuous self destruction. Just yesterday the GOP was apoplectic about an ad against pig castrater Joni Ernst claiming an ad portrayed her as a chick and now they come back with the typical "this is no big deal/can't you take a joke" response to these antics. The GOP is made up of complete hypocrites. What war on women? You lefties are idiots. Lets make up some more lies to deflect the incompetence of your own failed agenda. "the picture with the republicans was an obvious humorous picture." Yeah, nothing says humor like condescending, patronizing portrayals of women as mindless fashionistas addled by magazine frippery. "the picture with the democrat women was an obvious attempt to deceive." Haha....why? Because there's no way these women would ever be reading legislation? You just doubled-down on the misogynistic condescension, champ. Best case scenario for 2016 – Clinton vs. Bush. It's a sad, disturbing time in our history when another Bush is the better option for a now pathetic party of pseudo-morals. Name – Have you ever read any of the congressional legislation about repealing women's reproductive rights over 30 times? Idiots might be a better descriptor of the GOP. @rla, "The liberals will make a political issue out of 1 ply vs two ply bath tissue– Can they get any lame?" I think you need to look in the mirror and see what the teaklans are all about. If this was something our President was pondering they WOULD make it an issue. Your party is the one trying to shove their crazy beliefs on everyone. repos are so stupid they have no clue how offensive they really are. And some of the post here only go to emphasize that . If no war on woman why are they state by state trying to shut down woman"s health clinics worrying about Hilarys age and acting like that idiot palin knows what she is taking about? Putting her up for vice president was a slap in the face to any woman with an IQ of 30 or more. Get real the GOP is run by rich old white guys that think all woman should be in the kitchen or standing behind their man. When did Republicans get so stupid?